Anchor Audio announced the newest arrival to the Anchor AIR product line – the Bigfoot and Beacon AIR. The company first released the AIR wireless companion technology in June 2016 at the InfoComm International trade show, and was initially only featured in the Liberty Platinum and MegaVox Pro product lines. Shortly after InfoComm 2016, the company added the Go Getter to the AIR product line by popular request. 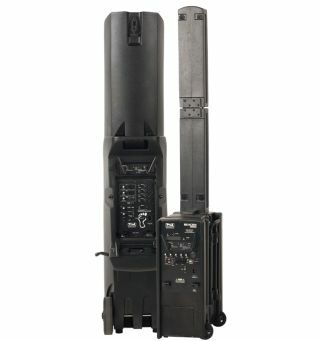 The Bigfoot and Beacon line array’s now offer the AIR wireless technology, and have complete wireless capability and connectivity between units. The Bigfoot and Beacon AIR’s are not passive companion units, but instead, are main units with either an AIR transmitter or AIR receiver built-in. The units can be used together for larger coverage or separately as stand-alone units. The Bigfoot and Beacon AIR systems are battery powered, operate 6-8 hours or more on a single charge, and receivers can be placed 150+ feet from the transmitter. AIR transmitters and receivers come as an optional built-in upgrade to the main sound system and replace the CD/MP3 combo player in the units. The transmitter can connect to an unlimited number of AIR wireless companion speakers. The AIR wireless technology offers 100 user-selectable channels operating within the 900 MHz frequency, which is one of the few clear channel ranges available and, therefore, limits interference from competing signals. The Bigfoot and Beacon line arrays are durable and easy to transport with built-in wheels and handles. Delivering 130 and 120 dB of clear sound respectively, these portable sound systems are ideal for both music and voice amplification making it truly versatile. Currently, Anchor Audio offers AIR capability in the Bigfoot and Beacon Portable Line Arrays, Liberty Platinum and Go Getter Portable Sound Systems, and MegaVox Pro Portable PA System. All of the Anchor AIR product line, including the Bigfoot and Beacon can be mixed and matched to fit your ideal audio solution setup. The AIR companion transmitter also connects with Anchor Audio’s Assistive Listening Devices (ALB-9000), which operate on the same 902-928 MHz, resulting in an immediate ADA-compliant portable sound system. Main-unit systems are available with up to two wireless microphone receivers in addition to the AIR wireless companion transmitter. Like all of Anchor Audio’s portable sound systems, the Anchor AIR products are manufactured in the USA, ship same day, and are covered by an industry-leading six-year warranty.